Effective communication in the workplace is of vital importance. This ensures that employees know what they need to know in a timely manner and through the right channels. For this purpose, intranets and CRMs have come to existence. The problem with these tools, however, they can be costly. 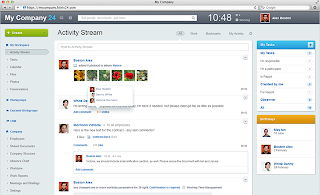 Bitrix24.com is a corporate intranet system that aggregates the features of a free CRM, free file sharing, free real-time streaming, free messaging system, free workforce monitoring, free activity planning, etc. As it is cloud-based, it can be accessed anywhere via a smartphone or a browser with no installation needed. For small businesses with at most 12 employees, Bitrix24.com is absolutely free. For those with more than 12, subscription is $99 monthly, with no additional fee for every additional user. If there's some place you need to go, air travel is the fastest way to get going. And with the emergence of low-cost airlines and online ticketing sites, air travel has become cheaper, too. However, competition among these airlines has grown fiercer that most of them have opted not to share their promotional offers with price-comparison websites. This, in effect, results in a bargain hunter hopping from an airline to a ticketing to a flight site to find the best airfare deals, pretty tedious and time-consuming. Focused solely in coming up with the best and cheapest airfare deals available, JetRadar.com is a search engine that carefully looks through 728 individual airline sites, hundreds of flight and ticketing sites and makes the data available for public use in a single site, drastically limiting the time and energy it takes for a consumer to finally snag the airfare deal that works best for him. The name you assign to a business, product or service can be an advantage - IF it's unique, catchy, relevant and easy-to-remember. On the website front, with sites cropping up from nowhere practically every minute of the day, most of the good domains have already been taken. If you're adamant about getting that unique and catchy name, domain or perhaps even a slogan, branding agencies can definitely help. But if you're strapped for cash, they won't be of much help. Started in 2007, PickyDomains.com is an online naming service with a contributor base of over 50,000 registered members. 50,000 - just imagine how many suggestions the group can come up with! To start receiving suggestions, register as a client, make the required downpayment of $50 for a name or domain ($75 for a slogan) and list down your naming parameters. Now, this is what makes this service risk-free - if none of the suggestions matches your naming needs, you can ask for a refund.